A combination of diplomacy, legal challenges and activism could end the program of US drone strikes. The tangled path to ending US drone strikes will be mapped through diplomacy, courtroom challenges, activist protests and pressure on the mainstream media to challenge official secrecy. On the diplomatic-political front, a de facto agreement between the US and Pakistan over Afghanistan could end the drone strikes concentrated on Taliban sanctuaries in North Waziristan. Since the US is withdrawing ground troops from Afghanistan and cannot afford to invade Pakistan, unmanned aerial vehicles are currently the weapons of last resort. Their attacks, however, have failed to defeat the insurgents and continue to inflame Muslim opinion in Pakistan and elsewhere, steadily provoking an eventual security threat to the United States. Until November’s election, Republicans (and Democratic hawks) campaigned furiously against any sign of US government “talks with the Taliban,” effectively squashing the diplomatic alternative or driving the process into complete secrecy. The impasse also prevented the release of US Sergeant Bowe Bergdahl, held as a Taliban prisoner in Pakistan since June 2009. The secret talks had considered a swap of Bergdahl for five Taliban leaders held in Guantanamo Bay. But the secret contacts led to a post-election agreement—now directly involving Pakistan—to transfer more than a dozen Afghan Taliban figures to Afghanistan’s High Peace Council, the negotiating entity that represents Kabul in the fragile peace process. Expecting release is Mullah Abdul Ghani Baradar, the former Taliban military commander whose capture by American and Pakistani forces in 2010 was blamed for the earlier derailment of the process. Others already released include an assistant to Taliban leader Mullah Omar, as well as former Taliban ministers of justice, communications and military commanders. The Taliban releases were announced on November 17 in Kabul by Salahuddin Rabbani, son of the former Peace Council leader, Burhanuddin Rabbani, who was assassinated in 2011. The clock is ticking loudly on the scheduled US troop withdrawals, forcing all parties to choose a power-sharing ceasefire arrangement or risk a renewed civil war by 2015. The current Afghan president, Hamid Karzai, is scheduled for replacement in new elections in late 2014, the same date that US ground operations end. Drone policies will also be taken up in the US-Afghanistan status of forces agreement talks, which began in mid-November and are scheduled to conclude in May. Pakistan is unlikely to agree to a diplomatic initiative unless it includes a termination of the drone strikes. And if the Taliban are integrated into a power-sharing arrangement in Afghanistan, the US will lack any further rationale for its drone and predator attacks. In his October 18 interview with Jon Stewart, President Obama issued a stunning invitation to Congress to “rein in” his administration, and future administrations, before another Imperial Presidency becomes his legacy. Obama suggested that Congress supply him with new “legal architecture” to harness the new nature of warfare to principles of democracy and accountability. A revision of the 1973 War Powers Act would be a starting point. The US drone policy toward Pakistan is setting off “alarms” among key State Department lawyers, including Harold Koh (Wall Street Journal, September 26). Similar alarms over the Libya intervention led White House lawyers to classify their internal memos as top-secret. In the case of the drones, both The New York Times and the ACLU have filed Freedom of Information Act requests, so far in vain. Pakistan publicly opposes the drone attacks on their country, has closed the CIA’s secret drone base in their territory and is considering a legal challenge at the United Nations. The most popular leader in Pakistan, Imran Khan, is campaigning for the presidency on a platform opposing the drone strikes. The Obama administration has created a “council of counsels” to define the legal parameters of the program. While claiming firm legal ground, their rationale is precarious, and worsening with time. The overall rationale, the US lawyers claim, rests on the War on Terrorism authorization permitting the military pursuit of Al Qaeda, its “affiliates” and states that harbor them. The question most worrying administration officials is whether it can unleash lethal force against the “consent” of a sovereign country, in this case Pakistan. 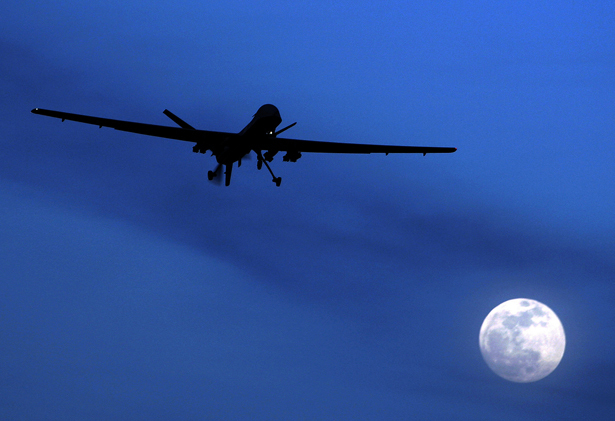 To prove Pakistan’s “consent” to the drone strikes is increasingly difficult. Years ago there existed a dual-approval system, but during the past four years the United States increasingly acted alone. The CIA sent faxes every month to Pakistan’s Inter-Services Intelligence agency (ISI) outlining the areas where the US drones would be deployed. The ISI sent back faxes acknowledging receipt of the information, nothing more. That ISI fax, combined with the lack of Pakistan’s military interference with the drone strikes, was considered a sufficient legal authorization by the United States, though never tested in a court. All that changed after the US assassination of Osama bin Laden in May 2011, after which the ISI never again acknowledged any US drone notifications. The silence was “unnerving” to US officials like Koh. They not only lacked any evidence of Pakistani approval, but the thin paper approvals they had been relying on were no longer being sent, ending any semblance of Pakistan’s approval. The price of killing bin Laden was lethal to the drones program. Last August in Washington, DC, American officials quietly raised the possibility of a “drone drawdown” with the leadership of the ISI. The offer lacked detail, but remains on the table. During the past year of secret on-and-off diplomacy, US drone strikes on Pakistan have declined to four per month as opposed to ten per month in 2011. As the ground wars in Iraq and Afghanistan were winding down, many peace activists turned to the drone program as a target of moral outrage and civil disobedience. While most of the actions have been local, Code Pink has provided coordination, a supply of literature and organized a productive trip to Pakistan, hosted by Pakistani peace forces, including a candid exchange with the US counsel in Islamabad. While a majority of Americans still approve of drone weaponry, nearly 70 percent have tired of the Afghanistan War and even larger numbers tell pollsters that the war cannot be won, creating a potential for dissent to rise. Congressional silence on the drone program remains shocking in comparison to the near-majorities of representatives who voted to oppose the thousands of US troops deployed to Iraq and Afghanistan. Outgoing Representative Dennis Kucinich chaired the only serious “hearing” on the drone program just this month. Even with Kucinich gone, someone in Congress will inevitably fill the vacuum. Excessive state secrecy, when it concerns appalling and illegal military actions, has a way of eventually provoking powerful public condemnations from citizens grown increasingly suspicious of government bureaucracies. Why else would administration officials be “unnerved” by the public implications of their own program? Why would President Obama, after first inviting a “conversation” about the previously secret policy last year, then go so far as to invite the Congress to rein him in? They may have an intuitive sense that the program is vulnerable. As the Times’s Scott Shane has said, “It’s impossible to keep the strikes themselves secret, but you’ve never had a public debate by Congress on it.” That immunity is ending.